HartyHarHar: Ibanez Guitars Are Here! WE RECEIVED OUR first shipment of Ibanez guitars Wednesday at Second String Music, and man, are they sweet. My favorite so far is the Artcore AF75. You can't beat a beautiful hollow body guitar for sheer jazzy tone and playability, though I'm amazed by how much this guitar booms on the front pickup. This thing might look good at a Cheeseburger gig .... but I'll put it on the floor for now. It didn't take long to sell our first Ibanez, to SSM Hall of Famer Wayne Bridges. 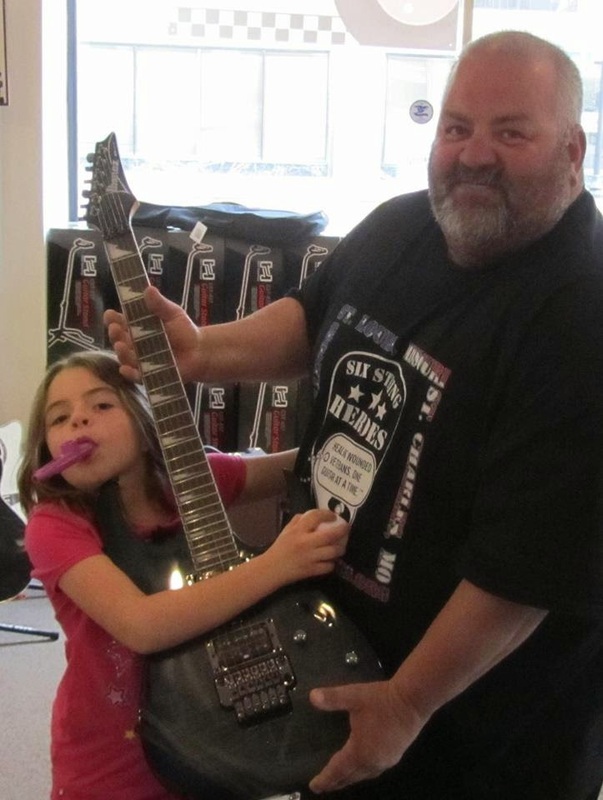 He was one of our first Quincy Six String Heroes students and he's a legend around here, especially because he has his daughter, Riley, to keep him on his toes. She plays a pretty mean kazoo, too! We have several basses, too, slim-bodied and punchy. We are always trying to get better and grow, and we think Ibanez will help us. Come on down to Fifth and Maine to check it out yourself!